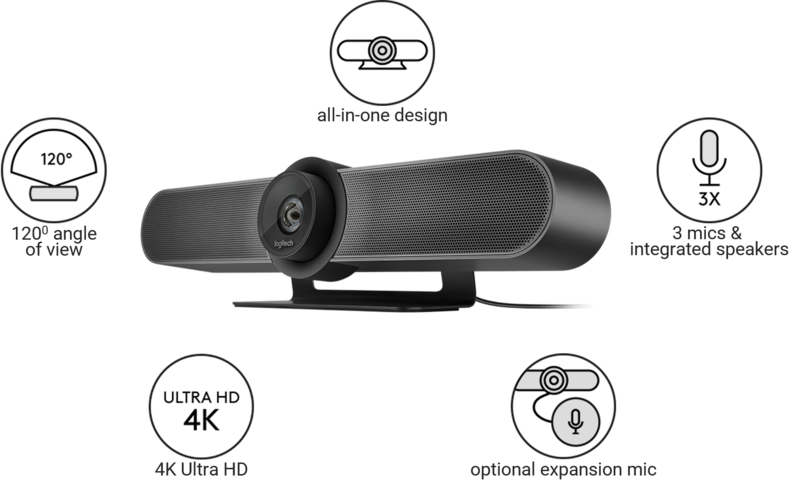 MeetUp is Logitech’s premier video conference camera, specifically designed for small conference rooms and huddle rooms. Let's get real, crowding around laptops (phones or tablets) just doesn't cut it anymore. It's time to experience a real video camera, with 4K optics and a super-wide 120-degree field of view. Go ahead and meet at the round table, MeetUp makes every seat at the table clearly visible, all in 4K HD clarity. Logitech also designed the MeetUp to be an "all-in-one" setup, camera and integrated audio, optimized for huddle room acoustics, ensuring everyone can be heard as well as seen. This camera is a brand-new design, ready for all your small spaces, or even a medium sized conference room with the available expansion mic. Regardless of the video conferencing software you use (Zoom and Zoom Rooms is our favorite), you'll like this camera. And it looks great, either above or below your display. Looking one of the easiest cameras to setup and start using? Well you just found it with the Logitech MeetUp!